No siphonage, no noise, no smells! Dry sealing valve prevents the escape of odors from your waste system into your RV and eliminates the need for check vents. HepvO® is a self sealing valve designed to close the waste connection below a sanitary fixture to prevent the escape of foul sewer air into the dwelling. HepvO® unlike conventional waste traps, does not rely on trapped water to create a seal. Water seals are prone to failure by Evaporation, Siphonage and other mechanisms. Instead, uses a self sealing membrane which performs the same function as a water seal trap but without the risk of depletion or freezing. The HepvO® Sanitary Waste Valve means enhanced plumbing design and system efficiency, without compromising performance or risking the escape of foul air into the living space from the drain or sewer. - Waterless – no need for trap primer. - Admits Air – auxiliary venting not required. - One Way Valve – prevents foul odors. - No Siphonage. No Noise. No Smell. - Not vulnerable to evaporation or freezing. - Enables multiple fixtures to be located on the same waste branch. - Saves cost by eliminating air admittance valves and reducing the amount of pipe used. - higher flow rates and more rapid discharge from fixtures. - Can be used safely on all applications, even where discharge is intermittent and a regular tap would dry out. - Perfect to solve problems in existing failing systems and on applications where fixtures are only used occasionally, such as guest bathrooms, holiday homes, boats and mobile homes. HepvO® is the innovative hygienic Self Sealing Waste Valve. It replaces the traditional water-seal trap and prevents the escape of foul sewer air from waste discharge systems. Unlike conventional waste traps, HepvO® does not rely on trapped water to create a seal. Water seals are prone to failure by Evaporation, Siphonage and other Mechanisms. Instead, HepVo uses a self sealing membrane which performs the same function as a water seal trap but without the risk of depletion or freezing. HepvO® actively eliminates negative pressure within the waste system by opening and allowing in fresh air until a state of equilibrium with atmosphere is reached. This means that secondary venting of the waste system via the inclusion of air admittance valves in the waste system is no longer necessary. Reduces pipe length, allows multiple branch connections and increases flexibility in location of fixtures. 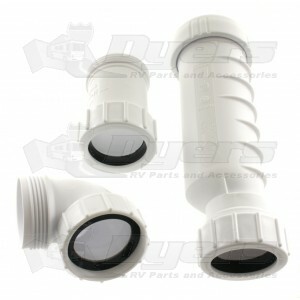 Waterless trap, valve and adapter kit. I purchased the product to replace the bathroom sink "P" trap in a 1998 Southwind 32V. Before the purchase I knew it would be a tight fit because I didn't have sufficient black pipe to play with. Also, the distance from the bottom of the sink to the top of the "P" trap was shorter than the adapter and the black pipe was at a weird angle in relation to the "P" trap. Even with these problems I decided to order the product anyway and delivery was prompt -- everything I've purchased from Dyer's has been prompt. I had hoped my installation would be as easy as the video..It wasn't but with the help of 2 rubber couplings I completed the installation. One coupling was installed after I cut and reduced the size of the adapter and the other coupling solved the angle problem. The nice part is the gray tank smell has been eliminated. Product works as expected. Used for a shower trap. The low profile kept things nice and tight under the trailer. Not cheap but unique and/or quality products rarely are. We have a 40' Fifth Wheel that was factory ordered with plumbing for onboard washer and dryer, however as new "Full Time RV'ers" in 2007, we elected to do without the W/D in lieu of additional storage for the first 3 years. My wife finally decided that having her own W/D was necessary, however on occasion we would get holding tank odors in the area of the W/D closet. My favorite RV Service Center installed our 1st HepvO in the washer drain line and discovered that the factory P-trap was dry, even though a wash load was recently run. This brings up the whole purpose of using one of these "dry traps", especially in applications where there is minimal use and in the case of a moving RV, the potential to displace the water barrier in a P-trap. As other reviewers have stated, a side benefit is that it will potentially free up under sink space and these units can be used horizontally or vertically, and in our 2nd application, on a common diagonal drain for the bathroom sink and shower drain. I eventually will replace the under sink P-trap with another unit and recently install one in my son's home for the furnace condensate drain. In total I have purchased 7 of these units and still have 4 on hand. It appears that about $25 is the best street price, but if you are having holding tank or sewer line odors, this is well worth every penny spent. Great product - does all that is advertized PLUS! I am buying more soon to finish up RV and use at home as well! !